June will be a huge month here at Southeast Texas Railfan! On June 7th, I will railfan at my typical spot in Rosenberg, TX. On June 24th, I will leave for CALIFORNIA!!!!!! Where all I will railfan will be announced later. As many railfans know, the Sunset Limited is a tri-weekly train. Most other long distance trains are daily. The reason? Union Pacific refuses to let Amtrak run the train daily. Sure, the UP Sunset Route is busy. However, Amtrak has a daily train on the much busier BNSF Transcon. Up until California, the UP Sunset Route only gets about 40 trains daily. The Sunset Limited is one of the least rode trains in the nation. Maybe if there was a daily Sunset Limited, then that would go up. Only the Sunset Limited and the Cardinal are not daily. I have decided to not change my blog platform. I figured that I have a lot on here, and that Blogger is not as good as I thought it was. Starting tomorrow I will go back to using Blogger instead of Weebly's blogging platform. I am starting to get fed up with how buggy the mobile app is when writing blog posts. Don't worry, the website itself will continue to run on Weebly, nothing will change about it except the blog link, and I will continue to update it. Since the FRA passed a law that allowed quiet zones, towns have been picking them up. There is much controversy about this topic, so I figured I might as well clear my mind on this. No I do not support quiet zones. 99% of railfans can speak with me. Why do I hate them? I will say this as bluntly as possible. The whiners who demand them were stupid enough to move close to the tracks. And cities listen to them. That is disgusting. 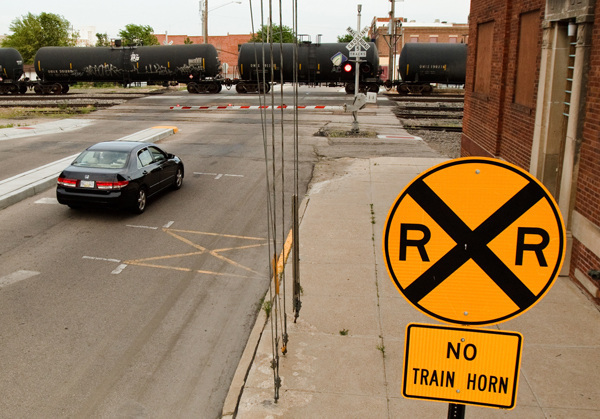 I would honestly prefer that all grade crossings in the country get grade separated, but that would cost more money. For now, here is a site that shows how extremely mature these people are. I am pretty sure it is not terrorism, and it does not cause cardiac arrest. Shout-out to the smart person who flip-flopped the Amtrak and Metrolink pictures. I like "return to the sanity and tranquility our city once had before the FRA ruling to commit torture." I bet most if not all people have never seen Orange without a train track. Another problem: Fatal accidents. Yes there are improved safety standards, such as pedestrian gates and medians. But what guarantee is there that pedestrians won't walk under the gate, or that drivers won't plow under the gate? There is no guarantee. What is the crossing malfunctions and no one reports it? Nope, no guarantee for that either. Guess what happened a few months after the San Clemente, CA quiet zone took effect? A Metrolink train hit a surfer who disregarded the crossing signal and didn't see the train. Please do not believe anything that says that train horns could cause death, because they can't. Thank you for reading all the way through, see y'all later in the week. In the US we have Amtrak. In Canada they have VIA Rail Canada. I have only been on one Amtrak train, the Cascades. On that train, the crew was very willing to help. They almost made us enjoy the fact that we got stuck for an hour due to a broken BNSF train. I have never been on any VIA train, so I am speaking from reviews I have seen. In the past few editions, you could not read Trains Magazine without seeing something about the VIA Canadian, the 4 night long train that goes from Vancouver to Toronto and vice versa. A few editions ago, there was a full story on the train. After reading it, you can bet I instantly looked it up. Now to someone who knows nothing about this train, four nights on a train may seem like a living hell. if you are confined to the elephant car on the circus train, then it probably is. However, the conductor and attendants will make you almost wish this trip took a lifetime. Yes it is expensive. This kind of pampering is always expensive. Just now while I was researching, I registered myself as a youth and put myself in a 1 person sleeper. Traveling solo, round trip is $1,765.93 USD, including tax. Imagine traveling as a family on this train. Keep this in mind: THIS IS NOT A TRAIN MEANT FOR FAMILIES. Yes, there are family cabins. But when you think about it, what would your kid under 13 do without their Xbox 360? Speaking from being a teenager, I did not start liking scenery until when I rode the Cascades back in December. That was beautiful. However, most little kids/pre-teens do not really care about the lake reflecting the snow covered mountains. Another problem: Internet. If you are American, like me, then you will not get mobile networks in Canada. This train does not have wi-fi, you will need to wait until you stop at Winnipeg, Edmonton, or Jasper. But when you have breathtaking, evergreen views like this, who needs to shoe shop? This is vacation, get off! 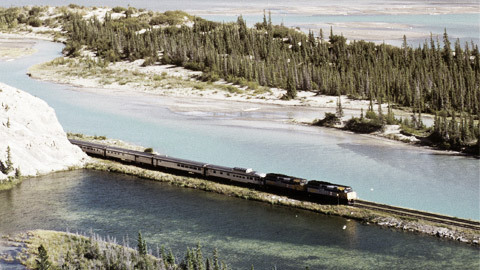 The Canadian is known by multiple sites as one of the best train rides in the world. It is a very classic train, dating back to 1950. They have been using the same classic Budd-style stainless steel cars since 1955. However, they may look archaic on the outside, but I guarantee they are beautiful on the inside. So, why not take a full journey and escape on this historic train? As many of you already know, my Trainz projects have been on hold for over a month now. Well, they still are. However, not for much longer! I hope to get back on track (pun intended) beginning next week, Spring Break. If that happens, however, then it will move at a snails' pace for a while (few months). In other news, I will be trackside on Saturday March 8 in Rosenberg, TX. Should be good action, as there typically is on a Saturday. Due to personal reasons, all work on Trainz and the site are on hold until further notice. Right now I am in the middle of my sophomore year in high school. 2 1/2 years until college, so I figured I may as well share with you all about what will happen to the site in 2 1/2 years. Why so early, you all may ask? My answer is always: Early is better than never. Let's get this straight. At the time being, I am not looking at any colleges in Southeast Texas. I have 1 1/2 years until I start applying, so that may very well change. But right now, the closest colleges I am looking at are in Lafayette, LA and San Antonio, TX. I am even looking at one in Northern Oklahoma. None of which are in Southeast Texas. I will always love trains, and whenever I look at a college, I of course have to make sure there is a track near it. However, when the time does come, yes I will probably get a new site, yes I will change the name (North Texas Railfan sound right to you all?) But as I said, yes it is early. So until the time comes, we will all just enjoy Southeast Texas Railfan with the latest update. It was a very fun outing. I would like to thank everyone involved and I do hope to be back in California soon.